Did you ever found a YouTube channel with an attractive cover? Or a beautiful poster on social media?. You probably think that it takes an advanced design skill and tool to create something like those ones. But no. You can also create the same stuffs even if you have no good design skill thanks to Canva. 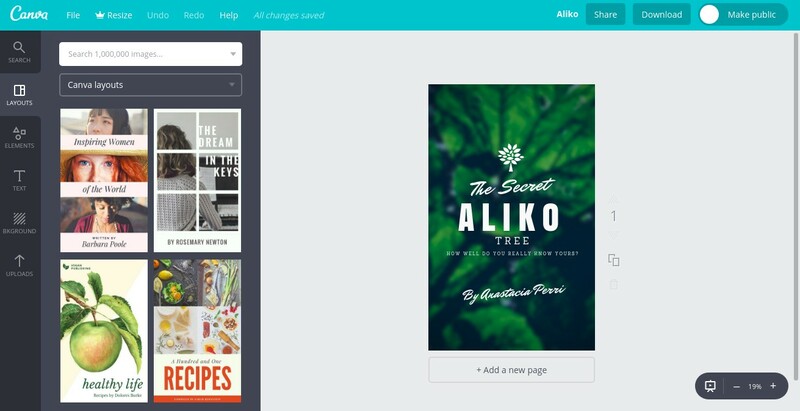 Canva is an online graphic design tool everyone can use, including non-designers. It takes no design techniques to use it. Even if you haven’t used tools like Adobe Illustrator before. Canva is a nice tool to create web-oriented designs like visual contents for social media, flyers, posters, Facebook cover, YouTube channel cover and so on. You don’t have to start everything from the big zero. Canva have prepared ready-to-use templates you can use. You just need to tailor the contents. Is Canva an online alternative to Adobe Illustrator? Not really. Professional designers keep need tools like Adobe Illustrator. Canva tends to ideal to be used by those who responsible of handling social media accounts, bloggers and digital marketers. With the available ready-to-use templates, they will be able to create the visual contents in minutes. As I mentioned, Canva is an online graphic design tool everyone can use. It takes no design techniques to use this tool. Everything has been prepared by Canva. Just select the suited template of the design you are going to create and replace the default contents to tailor your need, and you are done. From social media posts to marketing materials. Everything can be handled by Canva. In general, following are the designs you can create with Canva. In addition, you can also create designs of invitation, announcement, postcard and so on. You can even define your own dimension when creating a new design. Canva is definitely not the only online graphic design tool out there. But, it seems that Canva is the king in this market since it has a friendly interface. The user interface of Canva is easy to learn so anyone can use it. In general, the Canva interface is divided into two parts, a canvas at the right side of the working window and menu at the left side. At the top of the window, there are a Download button, Undo and Redo button respectively. In addition, there is also a toolbar on the working canvas. This toolbar will appear when you click a certain text or any element on the design template on the canvas. You can use the toolbar to make some formatting of a text and other element of the design. When you create a design with tools like Adobe Illustrator, you typically need to create all of the elements you need by yourself. For instance, if you want to add a tree icon or rectangle shape, you need to create it first. Different story goes to Canva. Everything has been prepared. You can add elements like icons, shapes, illustrations, and even charts without needing to create them in advance. The collections is also rich enough. One thing you need to know. Canva is a freemium tool. Not all elements will be displayed for free account. Other elements you can add to your design is photos. You can use your own photos or use ones provided by Canva. Canva provides thousands of photos you can use for free. Canva makes use of the Unsplash API to provide free photos to users. In addition, there are also paid photos which cost $1 per item. One of the fun things of being an online tool user like Canva is that you can work collaboratively with your team. You can work from different location via internet. Not have to be in the same place. Canva allows you to create a team to share your designs and also folders. You can invite your team members via email address. Free users of Canva are allowed to invite maximum of 10 members. If you are a social media manager and regularly use Canva to create visual contents, then you will be having plenty of designs. While you can download the finished design in a portable format like PNG or PDF, you may also save the raw file of each design in case you will need to reuse them in the future. Canva allows you to create folders in order to make your designs be more organized. Unfortunately, this feature may not too interesting for free users since they are only allowed to create two folders. Canva also provides free storage capacity. Every time you uploaded new images, they will be saved to this storage. Free users of Canva are given 1GB of storage capacity, while premium users will get unlimited storage capacity. Most online tools adopt the freemium business model. This business model allow users to use a the service for free, but with limited features and capabilities. Canva also adopts the same business model. You can use Canva without spending a dime as long as you want. But, there are more useful features and capabilities you are going to get of you upgrade your free account. Following is the comparison table between free version of Canva vs premium version. By the way, Canva offers two premium packages, Canva for Work and Enterprise. The main service of Canva is still a graphic design tool. However, Canva also offers other tools you use as well. Including a photo editor. The online photo editor offered by Canva is a bit similar to PicMonkey, but with fewer features. In addition, Canva also has a color palette generator. You can use this tool to inspect the colors of a certain photo to get the hex codes of them. Canva is a great online graphic design tool, but it can’t really replace the Adobe Illustrator or CorelDRAW role. Canva has a different market to those tools. Professional designers keep need drawing tools like Adobe Illustrator and CorelDRAW. Canva tends to ideal for internet marketers, social media managers and bloggers who have no good skill in design. Indie musicians and book writers can also use it to create book cover and CD cover. Canva would be a great tool for social media agencies since it can be used collaboratively.